To estimate surface area, the orientation of some combination of the tissue and the probe must always be isotropic, i.e., random in three dimensional space. If the surface and the lines are perpendicular to each other, there will be the maximum amount of intersections, and if they are parallel, there will be a minimum number of intersections. We wouldn’t want a condition where, for example, the lines we are probing with are always perpendicular to the object whose surface area we are looking for, or we would overestimate the surface area. Always use systematic random sampling. In this case there are two points for every cycloid so ‘2p’ is used. The isotropic fakir probe is the best to use for surface estimation, it requires thick sections but can be used on tissue that is preferentially oriented. 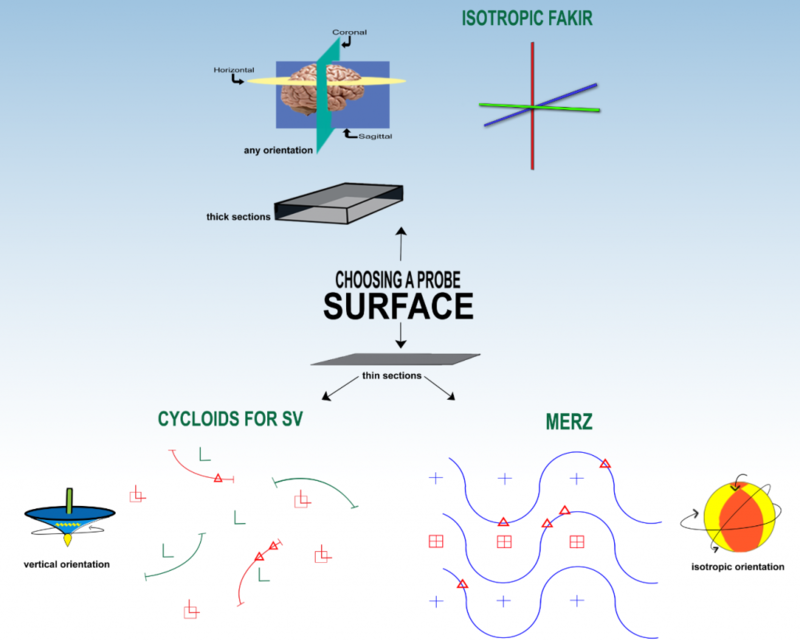 If you have vertical thin sections, you can use the Cycloids for Sv probe (Baddeley, Gundersen, and Cruz-Orive), or better yet, the Sv cycloids fractionator probe that will help with the systematic random sampling but still uses the NvVref method, just like Cycloids for Sv, to estimate surface area per volume, or the vertical spatial grid (Cruz-Orive and Howard) to estimate the surface area. Both of these probes make up for the fact that the orientation of tissue in vertical sections has only two random planes. 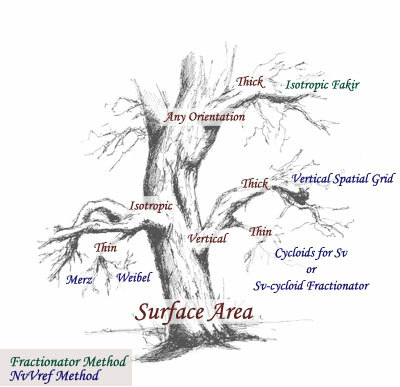 It’s probably always better to use Isotropic Fakir (see above) then Vertical Spatial Grid or Cycloids for Sv, since it’s much easier to prepare the tissue and because it uses the fractionator method to estimate. If you need to estimate surface area per volume, it may be an option to use Cycloids for Sv instead of an Isotropic Fakir/Cavalieri-point-counting combination. Howard, C.V. and M.G. Reed, 2010 Unbiased Stereology, QTP Publications, Liverpool, U.K.
Kubínová, L and J. Janácek , 1998 Estimating surface area by the isotropic fakir method from thick slices cut in an arbitrary direction. J Microsc. 191(2):201-211. Baddeley, A.J., H.J.G. Gundersen, and L.M. Cruz-Orive, 1986 Estimation of surface area from vertical sections. J. of Microsc. 142:259-276. Cruz-Orive,L.M., and C.V. Howard, 1995 Estimation of individual feature surface area with the vertical spatial grid. J. of Microsc. 178:146-151. Weibel, E.R. 1979 Stereological Methods. Vol. 1. Practical methods for biological morphometry. Academic Press, London.